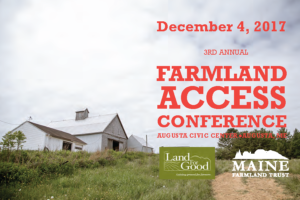 Maine Farmland Trust and Land For Good will host the third annual Farmland Access Conference on December 4, 2017 at the Augusta Civic Center in Augusta ME. The day-long conference will delve into some of the stickiest issues facing farming today. Workshops will tackle challenges of how to provide for a farm’s future when a farmer is ready to retire, and how next generation farmers can take on the stewardship of farmland in transition and shepherd the future of Maine’s food system. The conference is geared toward a diverse audience including retiring farmers interested in transferring land to next generation farmers; non-farming landowners that have an interest in making land available for farming; service providers and other advocates, including land trusts, conservation commissions, town planners and lenders with an interest in fostering affordable farmland access; and farmers seeking affordable farmland. Workshops will discuss farmland access strategies, impacts that both federal and state-level policies and programs have on farmland access and transfer, tools for enabling farm transfers, using conservation easements as a component of a farm purchase, how to prepare to buy or sell farmland or a farm business, and more. Conference presenters include local farmers and service providers working on the ground in Maine, as well as experts from around New England. Exhibits and networking opportunities will be available throughout the day. The conference is hosted by Maine Farmland Trust, and Land For Good. Sponsors include American Farmland Trust, and The Maine Department of Agriculture, Conservation, and Forestry (DACF). Additional sponsorship opportunities are available. For more information or to register, go to mainefarmlandtrust.org or call 207-338-6575. Cost of attendance is $15 per person and includes a lunch sourced from local farmers and producers.